Find artworks, auction results, sale prices and pictures of Ivan Ivanovitch Shishkin at auctions worldwide. Ivan Ivanovich Shishkin (b. Yelabuga 1832, d. St. Petersburg 1898) Russian summer landscape at Ostrovki near the Neva River. Signed Shiskin Ostrovki (in Cyrillic). Oil on cardboard. 35×40 cm. Ostrovki is situated at the Neva River between St. Petersburg at the Gulf of Finland and Schlisselburg at Lake Ladoga. Provenance: Arne Grundt (b. Halden 1886, d. Oslo 1975), Norwegian Consul in Wiborg and Director of Wiborg Timber Company, resident in Wiborg 1909–1939. Wiborg was situated in Finland at this time, and during the three decades Arne Grundt met Russian refugees, who crossed the Russian-Finnish border at Wiborg. The refugees often sold property brought along during their escape, and Arne Grundt acquired several items, including this work. At the outbreak of the Winter War 1939, the Grundt family had to flee to Norway in a hurry, so they quickly ripped the family's artworks down from the walls and cut some out of the frames to take them with them. Thence by descents until today. 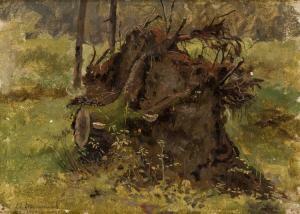 Description: SHISHKIN, IVAN (1832-1898) Hut in the Forest, signed. Oil on paper, laid on canvas, 46 by 33 cm. Provenance: Russian Art Evening Sale, Sotheby\’s London, 30 November 2009, lot 204. Acquired at the above sale by the present owner. Private collection, UK. Authenticity of the work has been confirmed by the expert V. Petrov. Hut in the Forest by the celebrated Russian landscapist Ivan Shishkin, offered here for sale, is from a series of works he painted in the vicinity of St Petersburg in the late 1880s–early 1890s. It is a fine example of a composition created from outdoor impressions. Around this time, Shishkin turned more and more often to depicting pine forest scenes. Since he had grown up in Yelabuga, among the pinewood expanses of the Afonasovskaya Ship Grove, he knew and loved coniferous forests like no other artist. Shishkin\’s contemporaries called him the woodland knight, the tsar of the forest, and, according to the artist Ilya Ostroukhov, he did actually bear some resemblance to a sturdy pine tree. The master was the first to open up the subject of pine forest for Russian art, and it was given a distinctive, always technically perfect and truly poetic embodiment in his works. His Pine Forest, Woodland Path, Sunlit Pine Trees, Morning in a Pine Forest and In Countess Mordvinova\’s Wood all enabled the artist not only to convey the beauty of the graceful, upward-soaring trees, but also to tackle head-on the challenges of contemporary plein-air painting and to draw closer to the principles underlying the creation of the genre of psychological landscape. Sensitive to the pioneering tendencies in Russian pictorial art that started in the 1880s, Shishkin sought to express, in particular, the more complex and transitory states of nature that match a person\’s mood, and so he concentrated increasingly on lighting – reproducing a light and airy environment on canvas. It is hard to say where exactly the picture Hut in the Forest was painted: in Sestroretsk or Pargolovo, near Siverskaya or in the picturesque spots on the Karelian Isthmus; what is certain is that it most vividly conveys these new qualities, which set apart Shishkin\’s works from the final decades of the 19th century. The elegant trunks of the pines are flecked with golden patches of sunlight, warm air streams in currents through the fluffy pine needles of the tall trees, and the space around the tiny woodland hut seems to have been penetrated by the sun and flooded with light. The branches of the trees, lit up by the sun, are executed with consummate skill. The brushstrokes glide smoothly, intertwine and, as they merge, create the impression of a living, fluid carpet of grass, slightly shrivelled in the bright sunlight, along the path. Shishkin is not seeking, as was often his wont previously, to carefully reproduce all the botanical details. On the contrary, the canvas is executed with a poetic freshness and combines an étude\’s immediacy of a general impression with the inner completeness and perfection of the image. While preserving the totally natural character of a motif that he found in real life, the artist manages to achieve a harmonious completeness of the composition. This typical yet, at the same time, inimitable natural spot has been captured by the artist with a light, rapid brush that conveys the immediacy of his gaze, as well as the vigour and freshness of a \“first impression\”. The sun-baked edge of the forest in the foreground, the group of graceful, bushy pines with the hut nestling in their shade in the centre, and the light, summer sky with a few clouds, that encloses the space, leave one with the sense of a quiet, serene summer\’s day. By using the frame to cut off the treetops (a device often encountered in Shishkin\’s works), the artist reinforces the impression of the huge size of the trees, which seem to run out of space on the canvas. Here, as in many of his best works, Shishkin is not trying merely to present a beautiful subject, or create artificially an uplifting mood. Nevertheless, despite its seeming simplicity, the Hut in the Forest encapsulates Shishkin\’s profound knowledge of Russian nature that he had accumulated in nearly fifty years of creative endeavour. It is no coincidence that these works formed the bulk of his monographic exhibition, mounted at the Imperial Academy of Arts in 1891, while many similar motifs were reflected in a series of etchings that the artist prepared and published in 1892. Pine Forest, signed and dated 1866. Oil on canvas, 91 by 70.5 cm. Provenance: Private collection, UK. Authenticity certificate from the expert V. Petrov. Authenticity certificate from the expert N. Ignatova. Literature: I. Shuvalova, Ivan Ivanovich Shishkin, St Petersburg, Khudozhnik Rossii, 1993, p. 41, illustrated; p. 38, mentioned in the text; p. 205, listed. 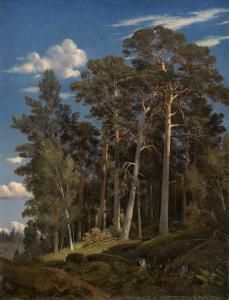 Pine Forest, offered here for auction, is a rare, early work by Ivan Shishkin. It is all the more noteworthy in that it was one of Shishkin\’\’\’\’\’\’\’\’s first paintings of a pine forest, a subject that would dominate his oeuvre for many years. Pine Forest was painted en plein air in the village of Bratsevo, north-west of Moscow, where Shishkin and his close friend Lev Kamenev, a fellow student from the Moscow School of Painting, Sculpture and Architecture, spent the entire summer of 1866 in an old manor house allegedly designed by the famous architect Andrey Voronikhin. The grounds of the estate stretched out to the rivulet Bratovka, a tributary of the Skhodnya, and adjoined the famous historic village of Tushino. Shishkin, who had just returned home that year after spending several years travelling abroad on a funded research trip, completely immersed himself in painting, working \“feverishly\”, as he himself said. 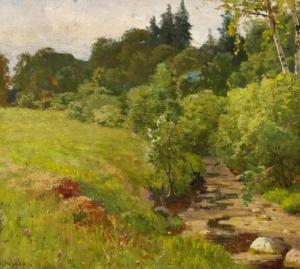 He would produce several plein air studies every day, and these served as the basis for Pine Forest. 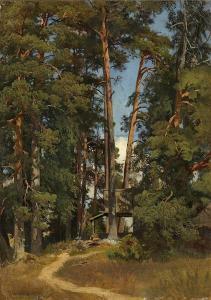 In Pine Forest, Shishkin, as always, depicts a specific place. The canvas is imbued with the light, air and sense of the vastness of space that are so characteristic of his work at the time, and which would later give way to more condensed and secluded forest scenes. He managed both to lend a note of refinement to the picture, and to find a way to convey the wild, untamed character of the central Russian landscape without clashing with the ideals of Russian Academism. The path leading down to the pond, the gentle slope of the hill, the boulders partly covered with grass and the tree roots that break free from the ground give free rein to the viewer\’\’\’\’\’\’\’\’s eye, allowing him to enjoy the harmonious relation between the forest and the vault of the summer sky with its scattering of clouds. Once the glory of the old estate, a pine tree-lined alley that used to lead to the summer-house rotunda is now barely discernible – only a few trees remain, interspersed with the large stumps of others that have been felled. The pines that covered the hillside and which inspired the artist are now also mostly gone. However, contemporary 19th century memoirs tell us that the whole slope at Bratsevo was clad in pine forest that continued right up to the manor house, and that views of the wooded slopes opened out from the clearing and from the shore of the estate pond. The artistic qualities of Pine Forest lend it special importance as a turning point in Shishkin\’\’\’\’\’\’\’\’s work. It is a remarkably complete, vivid forest scene, full of air and light, and executed in the best classical tradition. Carefully thought out and flawlessly executed, the picture is a precursor to all subsequent masterpieces by this illustrious Russian landscape painter. Indeed, it was Shishkin\’\’\’\’\’\’\’\’s paintings based on the Bratsevo sketches that drew him to the attention of the influential philanthropist and collector Pavel Tretyakov, the founder of the State Tretyakov Gallery, who was instrumental in bringing the artist success and public recognition.